Note: Part of the Science Minister’s odd non-official power on Mars was that the position was given full administrative access to all research projects on the planet. Ostensibly, this was a sign of respect and trust in the office, and was often cited as a very good reason to be very careful about who was chosen for the role. 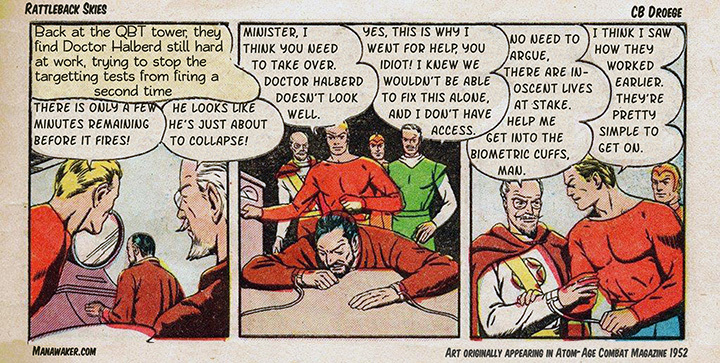 On paper, the Minister could, at his whim, enter into any lab on the planet, access any computer designated for research, and see all pertinent data on all projects, with only the fact of his position as passcode. In reality however, locked doors and politics kept the minister from truly having access to everything. Recycled Comics is supported by patrons on Patreon!